Kasenda Village, Zomba, Malawi … In a small, remote village in the heart of the sub-Sahara lives a family in a tiny grass thatched house made of mud. A few meters from this village is an old dilapidated building that houses a small Community Based Organization. The organization’s main objective is to source resources and reach out to orphans and vulnerable groups of people around the community. This organization serves a population of over 10, 000 people from 21 villages. Among other subjects the organization offers HIV /AIDS preventive messages to the community, as well as teaching and training young people in community development activities, caring for orphans, the elderly and people who are physically challenged. Besides all of this, the organization offers hope and a future for the orphans by training them in vocational skills so they are independent. For years, this small village organization has been working with the Malawi Project through the Namikango Mission. The CBO has been a dependable pipeline of supplies to the intended people for a number of years. It is called Msamba Community Based Organization. 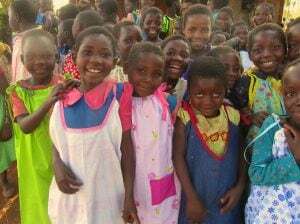 In partnership with Little Dresses for Africa, the Malawi Project, and a number of individual women who are making the dresses, 115 girls recently received a new dress. All were children, living with only one parent. In Malawi these children are seen as orphans. One parent has an extremely difficult time raising them alone. Pictured is Desire Matiki a 4-year-old girl, who resides in Kasenda Village. At this young age, she has already felt the pain of being an orphan and having little support. She is one of the beneficiaries of brand new dresses. Her mother confided that Desire only had one old, torn dress. She would wash it in the evening, dry it overnight, and Desire would wear it again the next day. The story about Desire is just one of the stories how little children affected after being trapped in the web orphanhood. Desire has one parent -her mother who works tirelessly to support her and the other four children alone. It was not surprising to see wide smiles revealing the true appreciation for the new dresses. Each will be a valuable and memorable gift to each of these girls, mostly because in many cases, it is the only one they have received in the past year. Desire’s mother had this to say after her daughter received a new dress, “I want you to extend my thanks to the people who have given my daughter this dress. I thank them very much. I could not have managed to buy a dress this time”. She further said her daughter would now have something to wear when her former dress is worn out.